In the last few years the world has witnessed drastic change in lifestyle and eating pattern across most developed and developing nations. While this paradigm shift is steered by adverse effects of unhealthy living, it is here to stay as people look for an overall better standard of living. As cutting down sweet seems easier way of committing toward a healthy living, the prevailing environment is highly conducive to the growth of the global low intensity sweeteners market. Low intensity sweeteners are food additives that taste like sugar but do not contain the same amount of calories as compared to the latter. Riding on back of the rising diabetic population worldwide and overall initiatives to reduce burdens of obesity, the demand for low intensity sweeteners has considerably risen. The next few years seems much lucrative as the leading players explore opportunities across emerging nations. They are currently investing in research and development of novel products to cater to the spiraling demand for sugar-free products. These activities are gaining pace across the world as prevention of health problems such as diabetes, obesity, and high cholesterol has become the need of the hour, thus tipping scales in favor of the global low intensity sweeteners market. Besides this, rising focus toward weight reduction is fostering growth in the market. Between 2017 and 2025, the global low intensity sweeteners market is projected to exhibit a CAGR of 5.8%. At this the market’s valuation will reach US$2.06 bn in 2025, from US$1.25 bn in 2016. By type, the global low intensity sweeteners market can be segmented into Tagatose, Xylitol, Trehalose, Isomaltulose, Allulose and others, which include sorbitol, erythritol and Maltose. Of these, Xylitol held the largest share in the market in 2016 on account of its rising application in the food and beverages industry. Considering this, tagatose emerged as the second-leading segment in terms of product. Based on application, the demand for low intensity sweeteners is noted across beverage, confectionary, pharmaceutical, and dairy products industries. Besides this, cereal products and table top sweeteners markets also exhibit the demand for low intensity sweeteners. Of these, beverage segment emerged dominant, holding over 31.9% of the market in 2016, followed by the confectionary and dairy product segment. Regionally, North America, Europe, Asia Pacific, Middle East and Africa and Latin America are the key market segments. Among these, Asia Pacific held the dominant share of 33.2% in the global market in 2016. On account of rising opportunities in India, China, Japan, and other emerging nations, Asia Pacific is projected to remain undisputed as the market lead through the forecast period. It is also prophesized to showcase the maximum CAGR, as enterprises invest in the research and development of novel products. Persistently rising demand from consumers in Asia Pacific will also aid the market’s expansion. Besides this, Europe has emerged as lucrative market for low intensity sweeteners as well. Countries such as the U.K. Germany France, and Italy have emerged as the most lucrative pockets in Europe. In North America, the market is forecast to witness rising opportunities in the U.S. Some of the most prominent names in the global low intensity sweeteners market are Cargill Inc. (Wayzata, U.S.A), Roquette Freres Company (Lestrem, France), Ingredion Incorporated (Westchester, Illinois, United States), Matsutani Chemical Industry Co., Ltd. (Itami City, Japan), E.I. Du Pont de Nemours and Company (Wilmington, Delaware, United States), ZuChem Inc. (Chicago, IL United States), Spi Pharma Inc., (Wilmington DE, United States), Food Chem International Corporation (Shanghai), EcogreenOleochemicals (Singapore), Gulshan Polyols Limited (Uttar Pradesh India). Low intensity sweeteners are sugar substitute that serves the purpose of sugar but has lower calories as compared to sugar and has much lesser sweetness quotient than that of sugar. These kind of sweeteners also has lower glycemic index which makes them low in calorie. The market for low intensity sweeteners is expanding consistently across the globe. 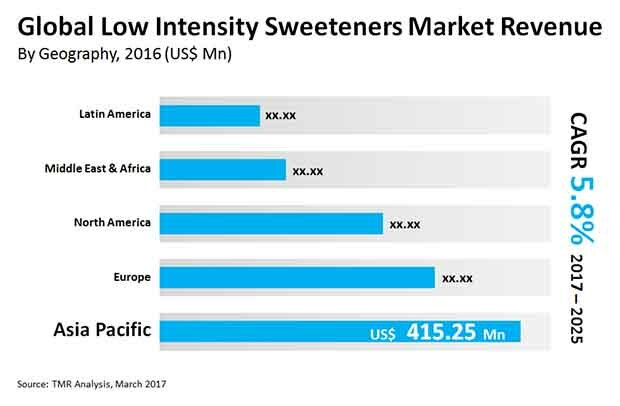 The market for global low intensity sweeteners is mainly driven by rise in demand for low calorie healthier foods coupled with increase in diabetic population across the globe. However, stringent government rules on several ingredients are restraining the global market for low intensity sweeteners. Additionally, growth potential from emerging markets is generating opportunities for the global low intensity sweeteners market. The report provides an exhaustive study of the Low Intensity Sweeteners market along with offering the market estimates, in terms of revenue (USD million) for the forecast period from 2017-2025. Further, the global market is classified on the basis of product type, and application. Rise in diabetic population is a major driver to the global market for low intensity sweeteners. Diabetes has become a chronic health issue among the population and is growing steadily across the globe and are mostly marked in the developing regions which include Asia Pacific and Middle East. Perceived health risks associated with diabetes, obesity, and high cholesterol has led to the preference in consumption of food and beverage products consisting of low intensity sweeteners. Manufacturers are thus keen to satisfy the rise in demand for sugar-free products through continuous research and development. Innovation of new products through strategic behaviors of the manufacturers has led to the increase in applications of low intensity sweeteners in food and beverage products. In addition, rising demand for low-calorie foods also drives the market in a positive way. Stringent government rules and regulations on several ingredients hinder market growth to quite some extent. There are several regulatory bodies, such as the Food and Drug Association (FDA) that have their own regulations regarding the utilization of low intensity sweeteners. All low-calorie sweeteners have to undergo several tests before the approval of the FDA in order to provide safety to the population. The delays in approval coupled with rise in cost toward introduction of new products are restraining the growth of the global low intensity sweeteners market. The study provides insights into opportunities prevalent for the market in regions such as North America, Europe, Asia Pacific, Latin America and Middle East and Africa. Asia Pacific is the most dominant region in the global market as well as the most rapid growing region. North America includes the U.S. and Rest of North America. The U.S. held the most dominant market share and it is also the most rapid growing country. Europe includes U.K., Germany, France, Russia, Italy and Rest of Europe. Rest of Europe held the most dominant share in the European market. Italy is the most rapid growing country during the forecast period. Asia Pacific includes countries such as India, China, Japan and Rest of Asia Pacific. Rest of Asia Pacific is the most dominant country in the region whereas India is the fastest growing region in the Asia Pacific region. In addition, Middle East and Africa includes country such as UAE, South Africa and Rest of Middle East and Africa. Latin America comprise of countries such as Brazil and Rest of Latin America. A competitive analysis of all the leading players is included in the report. The leading players include Cargill Inc., Roquette Freres Company, Ingredion Incorporated, Matsutani Chemical Industry Co., Ltd., E.I. Du Pont de Nemours and Company, ZuChem Inc., Nova Green Inc., Foodchem International Corporation, Ecogreen Oleochemicals and Gulshan Polyols Limited among others.